So this whole ‘plagiarizing’ Bleach situation got me thinking about the whole Super Junior jacking Lyle’s choreographies. In essence the situations are very similar. If you’re wondering what I’m talking about and you haven’t heard, Nick Simmons, son of Gene Simmons is under scrutiny by the manga fans as well as his own publishers. 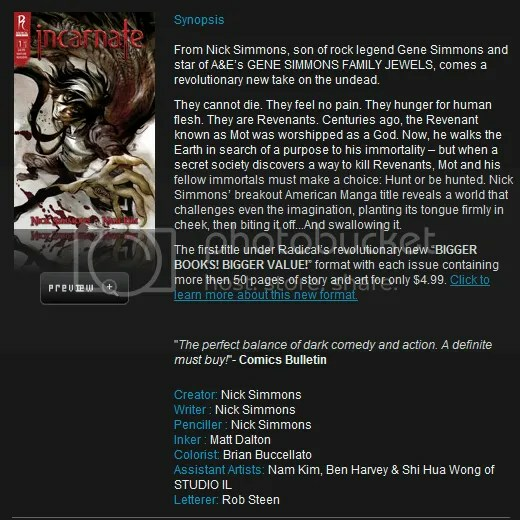 Nick set out to release his new “manga” called Incarnate. It was brought to Kubo Tite’s attention yesterday when he received message overload on his twitter stating that someone in the U.S. is copying his work of Bleach. I’m not going to go into the whole debate about it. You can read and a very well written article about it by Deb Aoki. For full comparison’s between the two you can see it at Bleachness@LJ. Now for my comparison to the SuJu situation before. Honestly, I’m only writing about it because the two situations are very very similar. If I was mangaka and people were making fan-art of my work, that’s a huge compliment. It means that my story, my art work is liked/loved by many people. Enough so, that people want to re-produce it in their own eyes. But, if someone blantly took my work, like straight copied it, got it produced in mass production and sold as ‘original’ I’d be mad. Realize Japan is on a whole different level when it comes what is entertainment and what sells/works. What works in that country won’t work here. It’s been tried and failed. This is like the Super Junior ‘copying’ 2 of Lyle Beniga’s choreographies. After reading about this situation, one can actually say they plagiarized his work. How? The difference of people learning a choreography and posting it on YouTube and having an actual Idol group perform it on national television (and in a dance battle that they ended up winning) is pretty big. There is no fine line in that sense. The situations are very similar in this case. Fan-art is copied but at the same time has the artists’ own style (or flare) to it. They aren’t getting paid huge amounts of money. Yes they are attempting to sell it, but like most of what twitterverse has been saying, they don’t make that much money and sometimes end up in the red. What Nick did was not only copy the original work, but claimed it as his own. He is a ‘celebrity’ and is/was going to make profit. It’s the same thing with SuJu. While they didn’t say it was their original choreography, they didn’t give proper credit to it’s original creator. There’s a fine line between fan-art and plagiarizing. There’s also a facebook group that has a list of other manga’s Nick is accused of plagiarizing.